Fits 13 and 15 inch Macbooks. Fits all similar-sized laptops. Can be stuck to anything! Our matte vinyl reduces light reflections to create a paint-like effect. Will fit any 13-inch and 15-inch Macbook. Fits on all similar-sized laptops. Can be stuck to anything! Environmentally friendly, hassle-free packaging: this vinyl decal is shipped in recycled envelopes with no plastic packaging at all. We’re amazed at what some people get away with when they sell vinyl decals online. From using cheap vinyl to selling products where you have to put the application tape on yourself, there are all kinds of things companies do to cut costs. Beware the dirt-cheap decal! You get what you pay for. Looking for a vinyl decal that looks great from all angles, lasts ages and doesn’t make you want to tear your hair out when you’re applying it? Well you’re in luck. This vinyl decal is made from the same premium stuff companies use to brand their cars and make their outdoor signs. Once your decal is applied, you can be sure it’s not going anywhere unless you want it to. This little guy will stick and just keep on sticking! How did we make this vinyl decal so amazing? We’re extremely proud of this vinyl decal and here’s why. We give it tender loving care every step of the way in our studio in Oxford in the United Kingdom. This decal is cut into high-quality outdoor sign vinyl with a matte finish. Matte vinyl reduces glare caused by light reflections to achieve a stunning, paint-like effect on your surface. Once cut into vinyl, this decal is weeded by hand. Weeding is when we remove all of the negative space from your final product. After that your decal is run through our taping machine and chopped to size by hand. Finally its put in recycled envelopes with no plastic packaging and sent straight to your door. That’s a whole bunch of steps for one decal. Some people think that’s quality overkill for a vinyl decal. We take that as a compliment. We love the look and feel of our vinyl decals and we’re not about to start compromising their quality. This decal will stick to pretty much any smooth surface you can imagine. Metal, plastic, glass, wood. Laptops, cars, windows, guitars, drums, floors, ceilings, walls, fridges. The list goes on and on! Is your surface smooth? Then this vinyl decal will stick down and keep on sticking. Make sure your surface is free of dust and grease. We recommend using an alcohol-based cleaner or methylated spirits if possible. Peel vinyl decal with application tape off backing paper carefully. Position the decal where you want it to be. Starting from the center, firmly press down on the decal with a plastic card. Pressing down firmly, work your way to the edges of the decal. Use your fingers to press down along the edges of the decal. Grab corner of application tape and peel back slowly. Now sit back and enjoy your new vinyl decal. Watch out for jealous looks! We take every step we can to reduce our environmental impact. 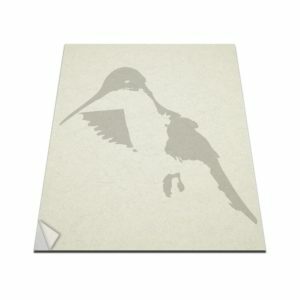 This vinyl decal is shipped in a recycled paper envelope with no plastic packaging whatsoever. This helps reduce our carbon footprint and means you don’t have to hassle with annoying plastic packaging. We are a small business. We pride ourselves on our customer service. Please feel free to contact us if you have any questions or special requests. You can write to us using the contact forms here, email us at [email protected], or call us on +44 (0)1865 959022. Looking for a custom decal? We love to make them so just get in touch! We do our best to respond to any customer emails as quickly as possible. Chances are we’ll reply straight away. However, please allow up to 24 hours for us to respond during work days and 48 hours during weekends. We can’t always be watching our screens! Not sure why you would want detailed technical specifications for a decal but, hey, why not? We’re proud of our materials. Face Film: Monomeric calendered PVC. Chemical Resistance: resistant to mineral oils, fats and fuels, aliphatic solvents, mild acids, salt and alkali for e.g. diesel oil, gasoline, paraffin, hydraulic oil, antifreeze, soap suds, etc.